The plunging of birth rates has emerged as one of the most significant demographic trends. For the first time, there appears to be the prospect of nations that will become materially smaller in population as a result. For example, the latest projections from the Japan’s National Institute of Population and Social Security Research are that by 2115, the population will be only 50.5 million, down 60 percent from the present 126 million. 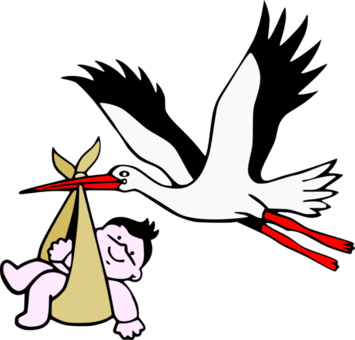 Perhaps the best measure of birth rates is the Total Fertility Rate (TFR), which estimates the number of births a woman of child-bearing age has over her lifetime. Broadly, a figure of 2.1 is required to maintain the population at a stable level --- slightly more than two children per mother. Overall, the TFR tends to be lower in higher income nations and higher in poor nations. The United States continues to have a higher TFR than other high income nations, yet has seen its rate drop to below replacement rate in recent years, according to annual data published by the Centers for Disease Control and Prevention. In 2016, the national TFR was 1.821, down 5.7 percent from the 1.931 of 2010. Even so, the US TFR continues to be above those of nations, like Japan (1.41), Germany (1.45), China (1.60) and Singapore, which at 0.83 may be the lowest in the world (2017 estimates). Even nations with some of the highest historical fertility rates, like India (2.43 down from 5.83 in 1965) and Bangladesh (2.17 down from 6.88 in 1965) are not much above replacement rate. This article summarizes the latest TFRs (2016) at the state level and makes short term comparisons back to 2010. The District of Columbia is not included in the rankings, because its demographic makeup is largely urban core, and lacks the range from urban core to rural that exists in the 50 states. As would be expected from such demographics (largely due to the high percentage of single person households), DC’s TFR is lower than that of any state, at 1.49. There are important regional differences between TFRs among the states. In 2016, all of the six states with the lowest TFRs were in all of the New England states. Vermont had the lowest TFR, at 1.540, but nearby Massachusetts, Rhode Island and New Hampshire were close behind, all at 1.55 or lower. 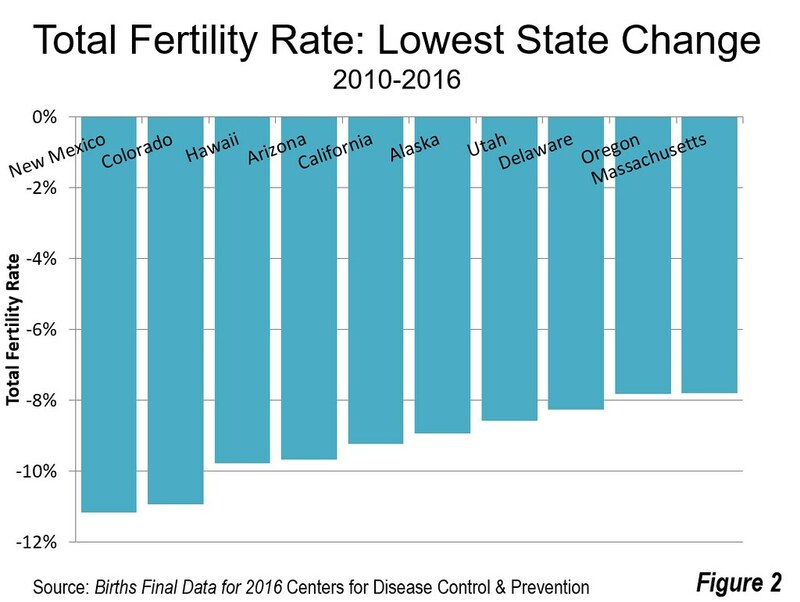 Connecticut and Maine had the fifth and sixth lowest TFRs, at somewhat over 1.60. The regional concentration continues, with New York, which constitutes the western border of New England, ranking eighth lowest and Pennsylvania, which borders New York at 10th. Two western states are also included, with Oregon at 7th lowest TFR and Colorado at 9th (Figure 1). 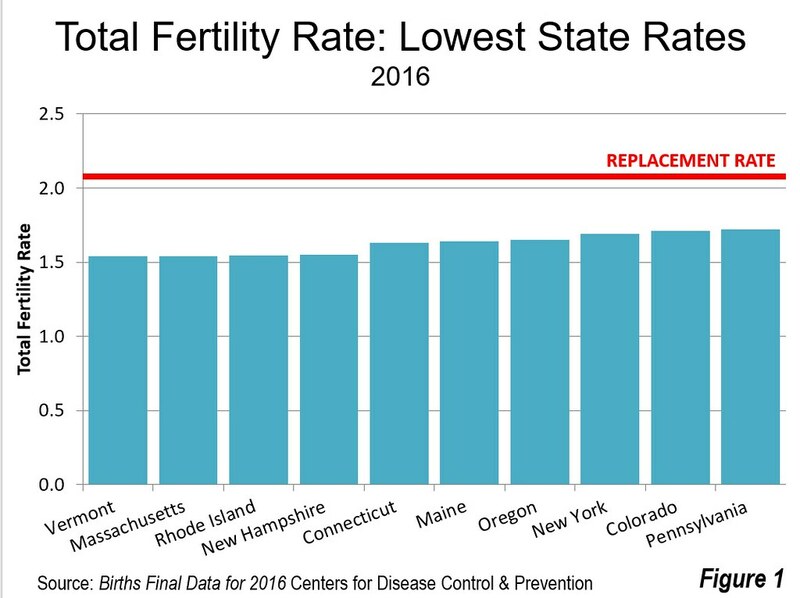 Low fertility New York and Pennsylvania are among the top ten states in population. All of the states with the lowest TFRs were in the East and West. There is also a strong regional prescience among the states with the largest TFR declines from 2010. Eight of the 10 states with the largest reductions are in the West. New Mexico and Colorado have experienced declines of more than 10 percent in just six years. The next six states with the largest losses all fell more than eight percent, including Hawaii, Arizona, California, Alaska, Utah and Delaware. Oregon, the eighth western state among the largest decliners, and Massachusetts had declines just below eight percent (Figure 2). Only five of the 50 states had TFRs higher than the replacement rate. South Dakota had the highest TFR, at 2.26, followed by Utah at 2.24. This is a surprising development, since Utah has routinely had the highest TFR in the nation. The six Great Plains states North Dakota, South Dakota, Nebraska, Kansas. Oklahoma and Texas were among the highest ten in TFR, as well as nearby Iowa. North Dakota, Alaska and Nebraska also had TFRs above the 2.1 replacement rate. 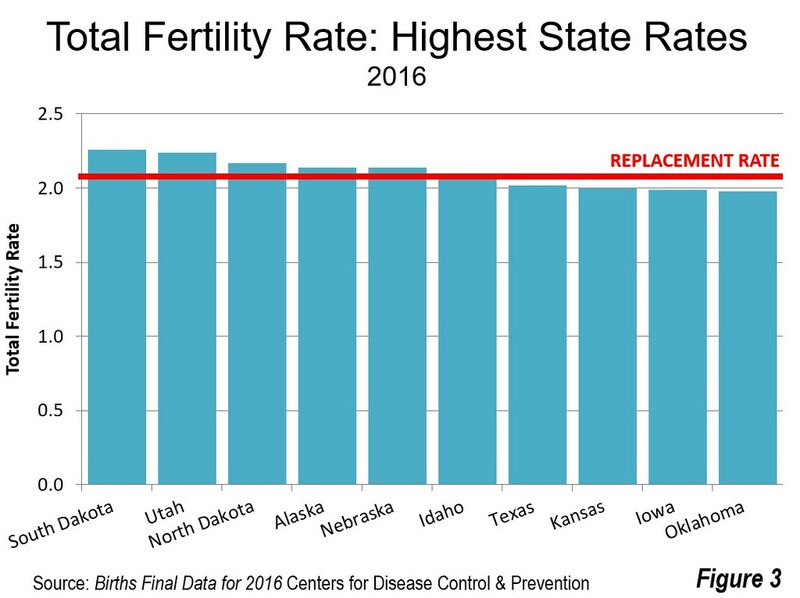 Idaho was only slightly below replacement rate. Texas, Kansas, Iowa and Oklahoma rounded out the highest 10 (Figure 3). Among the 10 largest states in the Union, only Texas had among the highest TFRs. Seven of the states with the highest TFRs were in the Midwest and South. All but one of the 50 states experienced TFR declines since 2010. The one state with a gain was North Dakota, which had a strong 6.4 percent gain. North Dakota state has experienced its first important population growth in more than 100 years, as domestic migration has increased to staff the state’s growing petroleum extraction industry. This has led to a reduction in the state’s median age to 35.0 years of age, from 37.4 in 2010. By comparison the US median age has risen from 37.2 to 37.9 years. The state’s improvement in the TFR reflects the younger age of the population and its association with a higher birth rate. Nebraska experienced a minor decline in TFR. The other states with lower TFR declines were in the middle of the country, South Dakota, Iowa, Louisiana, Minnesota, Kentucky, Arkansas and Wisconsin (Figure 4). All of the states that gained or had the least loss in TFR were in the Midwest and South. The regional concentration of the data is compelling. 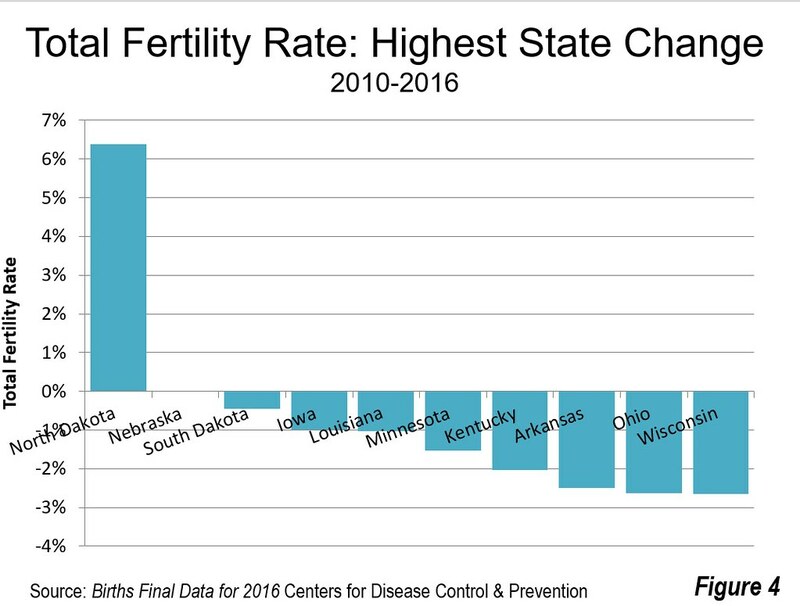 The states with the highest TFRs and the most fertility rate stability are nearly all in the Midwest and South, with only nominal representation from the West and none from the East. Among the states with the lowest TFRs, all but one are either in the West or East.